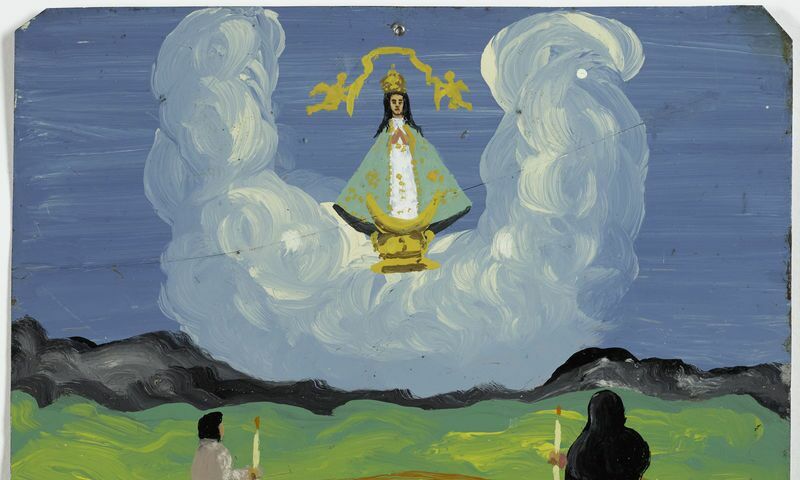 Retablo of José Cruz Soria, 1960. Oil on metal. Arias-Durand Collection. Retablos are thank-you notes to the heavens dedicated to Christ, the Virgin, or saints to consecrate a miraculous event. The votives on view—spanning the entirety of the twentieth century—were offered by Mexican migrants and their families to commemorate the dangers of crossing the border and living in the United States. Filled with emotive detail, they eloquently express subjects of greatest concern to the migrants, such as the difficulty of finding work or falling sick in a foreign land and the relief of returning home. The word “retablo,” from the Latin retro tabulum (behind the altar table), originally referred to devotional paintings hung in Catholic churches in Europe. In Mexico, reflecting traditions embedded in local cultures by Spanish conquest beginning in the sixteenth century, retablo (synonymous in this usage with ex-voto, lámina, and milagro) came to denote a small oil painting on metal placed on the wall of a shrine or church. Usually commissioned from local artists working anonymously, retablos feature a narrative that is both written and pictorial. First-person vignettes, dated and inscribed with the supplicants’ names, draw on a traditional vocabulary such as “doy infinitas gracias” (I give infinite thanks). In the luminous illustrations above the inscriptions, earthly figures share space with holy images and a dreamlike representation of the miracle. As they accumulate on church walls, both in Mexico and the United States, these votives become public records of private faith, fears, and familial attachments.